A frustratingly varied section of the long McCloud River Trail that offers occasional access to the river but long stretches of forest hiking far from the running water. 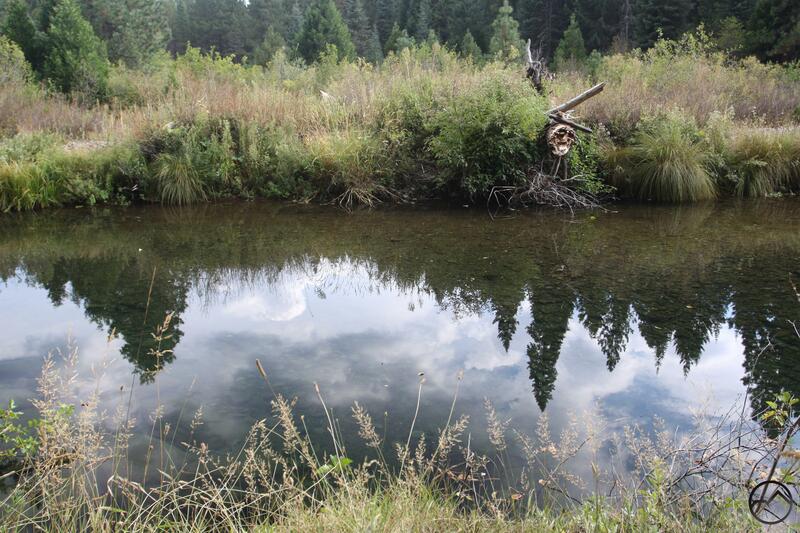 Highlights include two great swimming holes. The McCloud River near the unnamed swimming hole. Calm water at Nitwit Camp. The section of the McCloud River Trail that runs from Nitwit Camp to the Cattle Camp swimming hole is without doubt the least interesting portion of the trail. This is not to say that it is terrible. 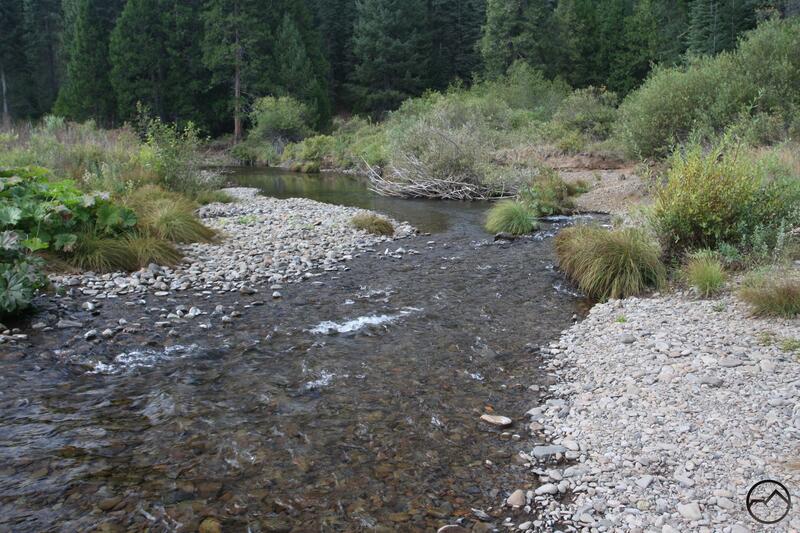 On the contrary, some sections are among the most scenic sections of the McCloud River. Unfortunately, these highlights tend to be fewer and further between than other sections of the trail. The biggest issue this section of the trail presents is a matter of routing. When the tail was originally constructed, the decision was made, understandably, to route the path well above the river’s high water mark. Doing this is entirely logical and has a couple of important benefits. Most importantly staying above the high water mark means that when the McCloud is swollen with spring-runoff or heavy rains the trail is not at risk of being inundated and destroyed. Consequently costly repairs won’t have to be made every time the river is engorged. A bonus to this is it makes it easy to shorten the trail by cutting across spits of land when the river makes tight, horseshoe bends. However, there is a major drawback to this as well. When the river flows through flat, broad areas it means that the high water mark is pushed well away from the water. For hikers this is a frustration sense the river is the prime draw for the trail and these sections hold little interest other than the forest. Most of the McCloud River Trail passes through shallow canyons which mean the path is slung high above the river, within both sight and sound of the rushing water. 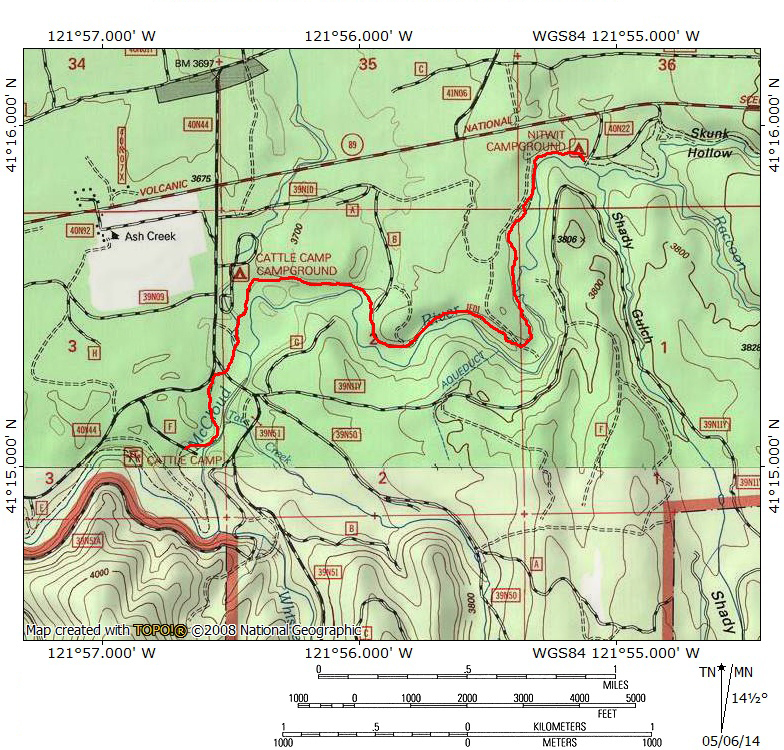 The segment from Nitwit to Cattle Camp swimming hole where the trail engineering is most obvious and most detrimental. The majority of this hike is well out of sight from the river, only on occasion does it come within sight of the water. Still, for those looking for a quiet trail with some extremely scenic moments with great isolation, this is still a worthwhile hike. Moreover, the final section of the trail leading up to the Cattle Camp swimming hole is easily the most scenic part of the trail outside of the stretch between Lakin Dam and Lower Falls. 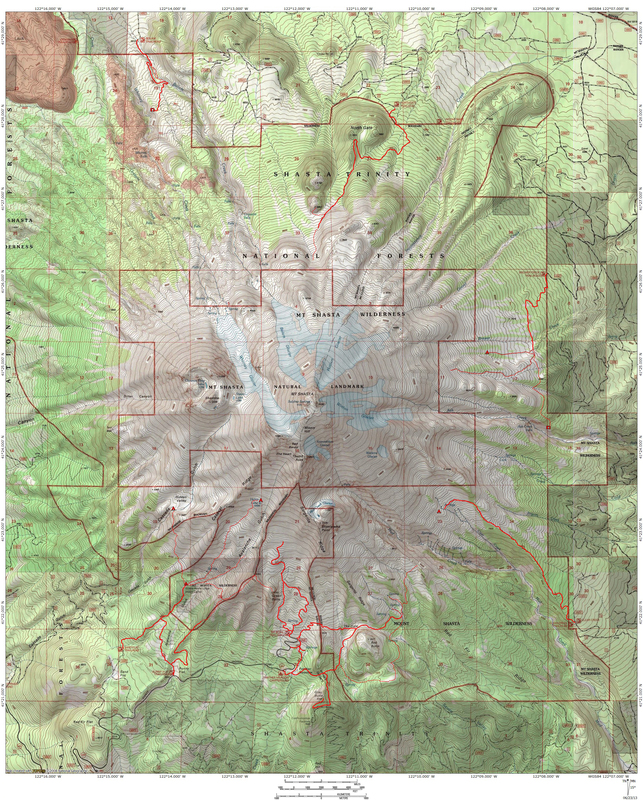 Read about the previous section of the McCloud River Trail here. 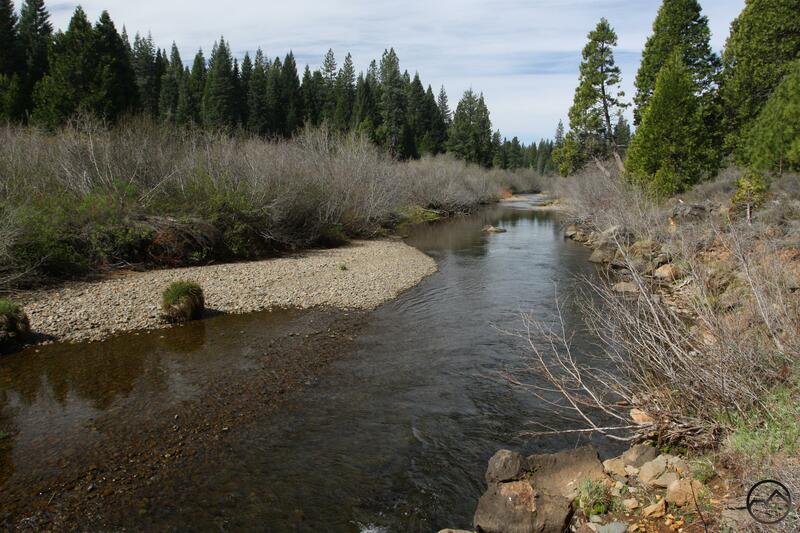 The McCloud River as it races away from Nitwit Camp. Nitwit Camp is an official primitive Forest Service campground. This means…very little. Dispersed camping is permitted throughout the National Forest so the distinction means nothing except that at Nitwit, like nearby Skunk Hollow, they have provided a picnic table. No other amenities are found here. In spite of this it is a great spot. The river runs alongside numerous great campsites while the forest is tall and the understory generally clear, allowing easy exploration. A small meadow area also adds to the setting. 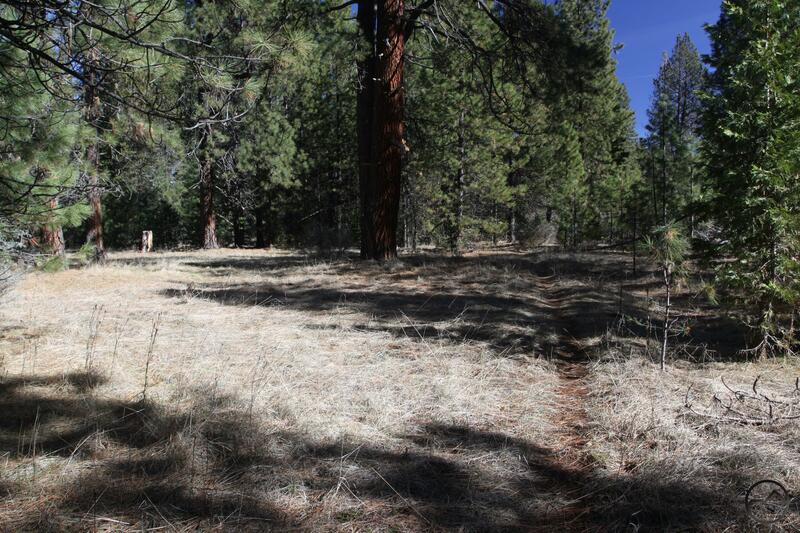 The McCloud River Trail is a bit indistinct here since it blends in with the dirt road that accesses the campsites. To find the path, head to the westernmost part of the clearing, near the meadow area. At that point the trail is easily discernable. Once on the trail it stays pleasantly close to the river. Unfortunately, this is not an enduring condition. After 0.35 the trail veers away from the water. Still, the path is pleasant, weaving through tall stands of trees and past boulders of dark basalt. Since the Algoma area, there has been little indication of this regions volcanic past and these boulders are reminders of the fiery events that took place here, though they only hint at the volcanic evidence further down the trail. Another 0.25 miles from where the path and the river parted company they meet again and maintain a parallel course for a while. Unfortunately the trail is well above the water and dense brush makes getting to the water’s edge difficult. Soon the McCloud River Trail and the river part company again. The McCloud makes a broad, sweeping turn to the west while the trail cuts short and stays well away from the river’s high water mark. After crossing an old dirt road the trail makes a sustained jog westward, staying away from the river, though it is at times visible and is generally audible. This is not an entirely unpleasant section of trail but the desire to be close to the river becomes frustrating at times. At the end of the westward leg, the path and river do converge again just before separating again and making a turn to the north. Proceeding to the north 0.25 miles leads to one of this section of the trail’s highlights. The path deposits hikers at a large bend of the river where a fantastic swimming hole is found. Though the waters are calm where the river deepens to form the swimming hole, just upstream and downstream from the hole there are nice riffles that make the rushing water pleasingly audible. The combination of deep forest, still and rushing water and the chance to take a dip make this a great spot. Surprisingly, it is not well known. It also makes a great camping spot. The McCloud River Trail passes through Cattle Camp. Continuing past the swimming hole leads to what is arguably the least interesting section of the entire McCloud River Trail. Once again the river enters a wide, level area and once again the trail quickly veers away from the water. Unfortunately the trail and river will not meet again for nearly a mile, the longest single stretch of the trail where the McCloud River is completely absent. To make matters worse, this section of the trail also feels the most intruded upon by the outside world. The first occurrence of this is the route’s passage alongside the Cattle Camp campground. Not a particularly exciting campground, the only real highlight of the area is the great old growth forest that surrounds the campsites. Beyond the campground the trail continues through the woods, making an unceremonious crossing over a usually dry Ash Creek. This shallow gulch gives little indication of the creek’s epic grandeur higher up on the flanks of Mount Shasta. The trail soon crosses over a dirt road which can be busy at times because it leads to a bridge that crosses the river and leads to logging lands to the south. Basalt gorge at the Cattle Camp swimming hole. On the far side of the road the trail continues south through the woods just a little further before finally rejoining the river. Though short, this is the most scenic section of the entire trail other than the long segment between the Lakin Dam and Lower Falls. The path, bordered by neatly arranged basalt rocks, is right alongside the river, where it easy to drop down to the water if desired. In the early spring there is an impressive display of Indian warriors. However, the highlight is the river’s short passage through a rugged, basalt gorge. Rather than stay on the trail, it is possible to climb out onto the basalt outcroppings and stare down into the crystal waters swirling past the rock. From there hikers can scramble over rocks just above the water to finally arrive at the Cattle Camp swimming hole. Alternately, the trail stays high, passing along the edge of a short band of 20 foot basalt cliffs before descending down to the swimming hole parking area where a bathroom awaits. 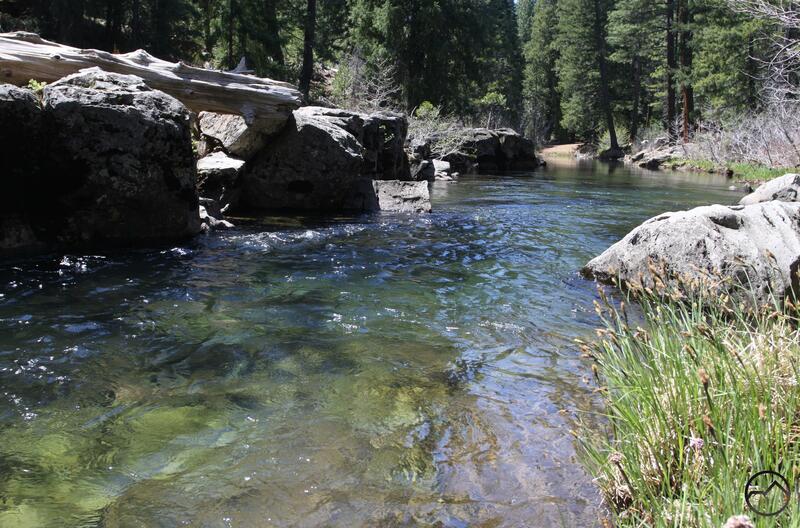 The Cattle Camp swimming hole is without doubt one of the most scenic spots on the McCloud River. After surging through the rocky gorge the river runs headlong into a heavily forested bench, impounding the river. The water must be over 20 feet deep in some parts of this swimming hole. To continue flowing, the river is forced to make a sharp 90 degree turn to the left, flowing over some rocks that help impound the water. There are nice dirt beaches to relax on and basalt cliffs and boulders to climb on. A great rope swing awaits for those looking for a bit more excitement. 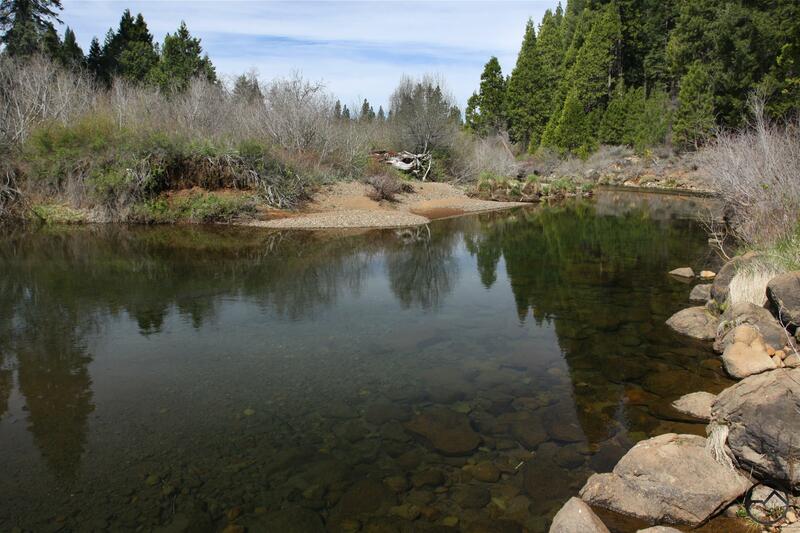 Though much of the McCloud River Trail between Nitwit Camp and the swimming hole is less than ideal, the final destination makes the hike worthwhile. From the main intersection in the town of McCloud, drive east on Highway 89 for 11.4 miles. Turn right on an unpaved dirt road. There is no signage but the turnoff comes at a low point in Highway 89.